← Under Construction. Home Fellowships. Over the last couple days I have pondered through a lengthy and detailed article that unfolds a sensitive subject that is hidden in the Torah and seems to reveal/attest to the need for a virgin birth of the Messiah. Following is a neat article that goes into some detail exposing another one of those mysteries that has been danced around, but never fully understood. And, the site that it comes from seems to have a number of other such interesting articles… I hope you enjoy this as much as I did. 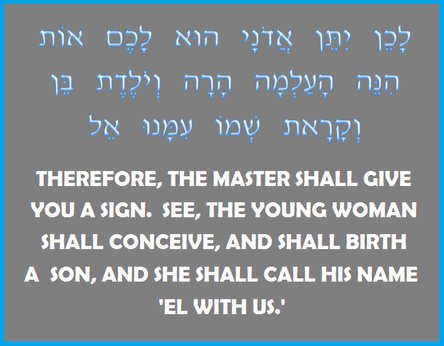 This entry was posted in Guest Post and tagged Messiah, Ruth, Tamar, Torah, virgin birth, Yeshua. Bookmark the permalink. 3 Responses to Is the Virgin Birth attested in Torah?? Read this at Al McCarn’s blog and was impressed enough to share it with some wise teachers I know who took a look at it. Their comments: Can’t find anything to argue with in this! Very interesting, indeed. Thanks for sharing. This fight against the virgin birth is just another sign of the times. As Jeremy points points out in his article, the Greek and Aramaic use a word that means virgin. Even the Hebrew, which has a word that really does mean maiden or young woman… would mean virgin anyway because a law abiding young woman would have been a virgin. Great article! Very in depth. Lots of wisdom in here.Thank you!